Plant power. New look. Same great taste. A good source of plant protein. Our Passion is Plant-Powered: We're nuts about nuts. And seeds, and beans, and fruits, and everything green and growing nature has to offer. Have you ever really thought about the magic of plants? Talk about strength, resilience and beauty. And all that leafy goodness is just waiting for you to tap its potential. You can call us what you want - plant-based, plant-biased or just plain plant-prejudiced. We've been rooted in plant power for over 20 years. Pour on our passion, so you can nourish yours. Discover the power of plants at Silk.com. 3 simple reasons to love Silk Soymilk. We believe plants are the way to nourish people and the planet. 100% silky smooth deliciousness. 8 g heart-healthy (In a diet low in saturated fat and cholesterol, 25 grams of soy protein per day may reduce the risk of heart disease. 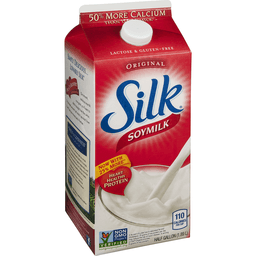 A serving of Silk Original soymilk has 8 grams of soy protein) plant-based protein per serving. Silk you can - Spoon! Try our creamy dairy-free yogurt alternative. How we make it matters. 50% more calcium than dairy milk (Silk Original Soymilk: 45% DV calcium; lowfat dairy milk: 30% DV calcium. USDA National Nutrient Database for standard reference, release 28. Data consistent with typical lowfat dairy milk). Love it or your money back (It's simple, friend. Visit Silk.com/LoveIt or call 888-820-9283 for a full refund. Limit two refunds per household per year. Proof of purchase may be required). Non GMO Project verified. nongmoproject.org. Dairy & lactose-free. Gluten-free. Carrageenan-free. Low saturated fat. Cholesterol-free. No artificial colors or flavors. Silk.com. how2recycle.info. Not recycled in all communities. Plant power. New look. Same great taste. 0 g sugar per serving. 30 calories per serving. Our passion is plant-powered. We're nuts about nuts. And seeds, and beans, and fruits, and everything green and growing nature has to offer. Have you ever really thought about the magic of plants? Talk about strength, resilience and beauty. And all that leafy goodness is just waiting for you to tap its potential. You can call us what you want - plant-based, plant-biased or just plain plant-prejudiced. We've been rooted in plant power for over 20 years. Pour on our passion, so you can nourish yours. Discover the power of plants at Silk.com. 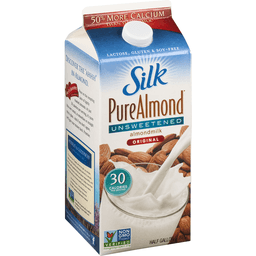 3 simple reasons to love Silk Almondmilk. We believe plants are the way to nourish people and the planet. 100% silky smooth deliciousness. 0 g sugar per serving. Say hello to Nutchello, a uniquely tempting beverage. How we make it matters. 50% more calcium than dairy milk (Silk Unsweetened Vanilla Almondmilk: 45% DV calcium; Lowfat Dairy Milk: 30% DV calcium. USDA National Nutrient Database for standard reference, release 28. Data consistent with typical lowfat dairy milk). Love it or your money back (It's simple, friend. Visit Silk.com/LoveIt or call 888-820-9283 for a full refund. Limit two refunds per household per year. Proof or purchase may be required). Non GMO Project verified nongmoproject.org. No added sugar. Dairy & lactose-free. Gluten-free. Soy-free. Carrageenan-free. No saturated fat. Cholesterol-free. No artificial colors or flavors. silk.com. how2recycle.info. New look. Same great taste. 0 g sugar per serving. Plant power. 30 calories per serving. Our Passion is Plant-Powered: We're nuts about nuts. And seeds, and beans, and fruits, and everything green and growing nature has to offer. Have you ever really thought about the magic of plants? Talk about strength, resilience and beauty. And all that leafy goodness is just waiting for you to tap its potential. You can call us what you want plant-based, plant-biased or just plain plant-prejudiced. We've been rooted in plant power for over 20 years. Pour on our passion, so you can nourish yours. Discover the power of plants at Silk.com. 3 Simple Reasons to Love Silk Almondmilk: We believe plants are the way to nourish people and the plant. 100% silky smooth deliciousness. 0 g sugar per serving. Say hello to Nutchello. A uniquely tempting beverage. How we make it matters. 50% more calcium than dairy milk (Silk Unsweetened Almondmilk: 45% DV calcium; Lowfat Dairy Milk: 30% DV calcium. USDA National Nutrient Database for Standard Reference, Release 28. Data consistent with typical lowfat dairy milk). Love it or your money back (It's simple, friend. Visit Silk.com/LoveIt or call 888-820-9283 for a full refund. Limit two refunds per household per year. Proof of purchase may be required). Non GMO Project verified. nongmoproject.org. Dairy & lactose-free. Gluten-free. Soy-free. Carrageenan-free. Cholesterol-free. No artificial colors or flavors. silk.com. how2recycle.info. 16 g protein per serving. 160 calories per bottle. New! What makes Fairlife Yup! 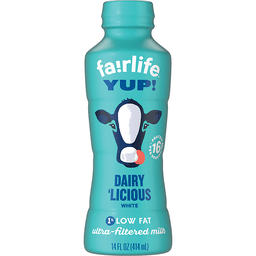 one-of-a-kind is pure, fresh Fairlife ultra-filtered milk. Our milk flows through soft filters to concentrate its goodness, so it tastes rich and creamy. Lactose free. Homogenized & grade A. Recycle me.